The audiologist will decide which specific tests should be done to determine the degree of hearing loss, the type of hearing loss, and the conditions of the ear canal and middle ear. The audiologist will also determine if the hearing loss is conductive (middle or outer ear problem) or sensorineural (inner ear problem or central processing difficulty of the brain). Pure-tone air conduction testing determines the softest tones that a person can hear at different frequencies, both low and high. Bone conduction testing uses a different type of headphone, and the results help the specialist determine if the hearing loss is originating from the outer/middle ear or from the inner ear. A speech reception threshold (SRT) test is often used with older children and adults to confirm the results of a pure-tone test. This test determines the lowest level at which the patient can recognize words or speech stimuli. Speech discrimination testing asks the patient to repeat words at a comfortable level. this assesses the person's ability to understand speech. If your speech discrimination score is poor, speech may sound garbled. 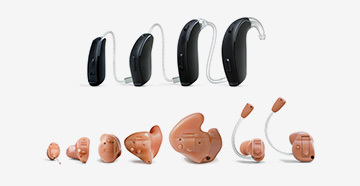 These scores and be helpful in predicting the usefulness of hearing aids. Before your appointment, the audiologist will want to hear about any complaints you have about your hearing. We will pay special attention to any concerns you have about exposure to noise, tinnitus, and balance problems.